It’s taken four years for these two heavyweights of the scene to create this album; and many a fan of both these artists, has been salivating at the prospect of hearing the two combine forces. 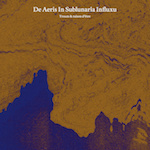 From the offset, ‘De Aeris Sublunaria Influxu‘ doesn’t disappoint, with a wash of light pads and drones that make up the all too brief ‘Folla’. Into all familiar lengthy territory this is followed up with ‘Alio Tempore’; with a wash of air filled pads that build with layer upon layer of emphatic drones that cloud a processional chime. From here on in, we are treated to waves of Dark Ambient and arcane undercurrents, providing the foundations to a melancholic breeze of resonating reverb-ridden layers of sound. ‘De Aeris Sublunaria Influxu‘ is a clever mix of light and shade; that alternates between the two at will. If I had any complaint, it would be the similarities between the sound sources used on many of the tracks; however, when an album is constructed as well as this is, then there is little to moan about. Mesmerising and as rewarding as this is, it will take little to encourage fans of both these artists to hunt this out, as I am sure they already have. For the uninitiated, if you were wondering if ever to dip your toes into the Dark Ambient/Drone scene, you wouldn’t go far wrong in picking this up first.